Aim for less added sugar in your diet! Women should get <5 teaspoons per day and men should get <9 teaspoons. A can of Coke has 39 grams of added sugar – nearly 10 teaspoons of sugar. 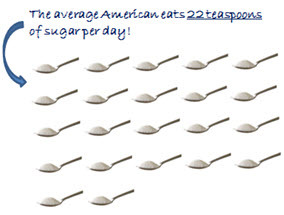 Many Americans consume 2-3 lbs of sugar each week compared to the end of the 19th century, when the average American consumed only 5 lbs per year! It’s not that sugar in and of itself is bad for you. It’s that when too much sugar is eaten, it replaces more nutritious foods like fresh fruits and vegetables, whole grains and lean sources of protein and dairy that can protect our bodies from chronic conditions like Type 2 Diabetes, stroke and cancer, overweight and obesity. Calories that come from sugar don’t provide us with any nutritional value other than energy. And too much energy (calories) = weight gain. Unless those extra calories are burned off with exercise. Quick Tip: On a nutrition label, divide the number of grams of sugar by 4 to get the amount in teaspoons. 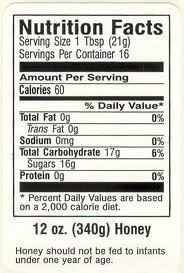 For example, on this label there are 16g of sugar in 1 tablespoon of honey. Divide 16 by 4 to get 4 teaspoons of sugar. Did you know…you can eat healthy even if all you have is a microwave? Combine water and noodles in a microwave safe dish, and microwave on high for 10 to 15 minutes, stirring every 5 minutes, until noodles are cooked through. While the noodles are cooking, chop the vegetables and set aside. When noodles are fully cooked, drain excess water, and rinse with cold water to cool the noodles. Replace the noodles in a clean bowl or mixing dish. Add in olive oil and salad dressing, and mix thoroughly into noodles, ensuring all noodles are coated (to prevent sticking). 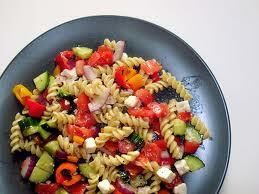 Add in cucumber, tomatoes, olives and onion, and mix well. Finally, top with fresh feta cheese. Serve chilled. Enjoy!